Yellow datterino tomatoes are a specialty variety native to Italy. The San Marzano gets a lot of attention but the datterino is equally prized in Italy. The yellow datterino is very difficult to source in the US. These tomatoes were a 2014 sofi awards finalist at the Fancy Food Show. They are hand selected for the Trentasette line and are free of additives, colorings or artificial ingredients. Just fresh-picked by hand and bottled naturally sweet yellow datterino tomatoes packed in their own juice. A simple tomato sauce over imported Italian pasta can’t be beat. Try the Filotea egg tagliatelle for a quick week night supper. 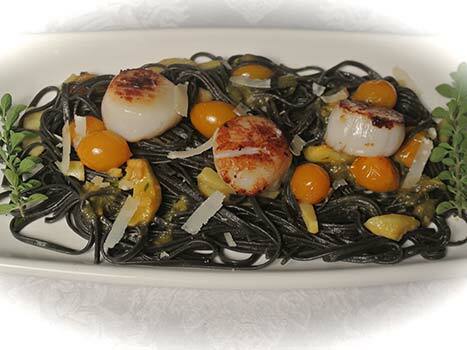 Or toss with Squid ink linguini and seared scallops for a little more pizzaz (see recipe ideas below). 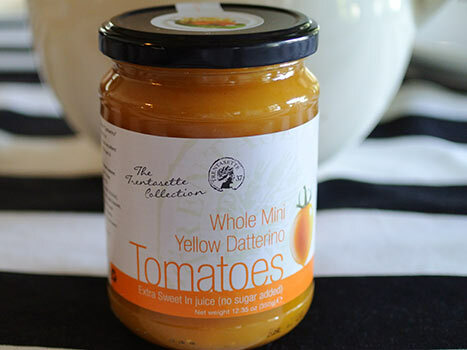 Yellow datterino tomatoes 12.35 oz jar (350 g). The Trentasette collection is a wonderful collection of artisanal ingredients from Italy. 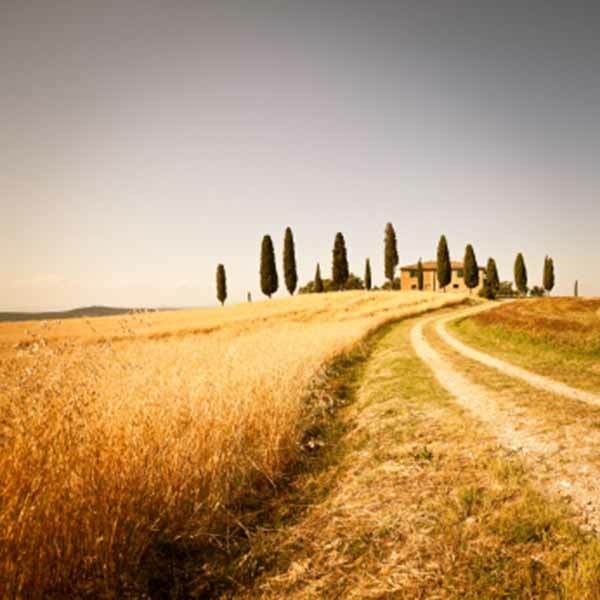 To be more specific, the name Trentasette--referring to the latitude of Sicily--all are from regional producers who take great pride to maintain quality standards and offer ingredients difficult to source in US markets. They have a wonderful line of truffle sauces, pestos and these wonderful datterino tomatoes. These datterino tomatoes are the yellow variety and come in a 12.35 oz jar (or 350 g). They are shelf-stable until the date on label, but they probably won't last that long. Yellow datterino tomatoes are a real treat. Use them in most any tomato based recipe but it is best to let their flavor shine. A simple simmered sauce of fresh yellow datterino tomatoes, a few cloves of crushed garlic is all you really need. Boil a good quality Italian pasta (such as Filotea Egg Tagliatelle) according to directions (four minutes in salted water) and toss together along with a healthy grating of fresh Parmesan. A quick weeknight meal that will not disappoint. Why would you go through the drive thru when you can prepare this delicious meal in about 10 minutes?